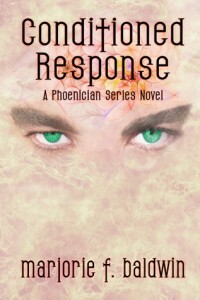 Author, Marjorie F. Baldwin, sent me an e-copy of her sic-fi (possibly romantic sic-fi novel) Conditioned Response (Phoenician Series). Shayla didn’t ask to be a Councillor. As a Phoenician, she shouldn’t have to live among the humans, let alone take part in their world. But the Seven Chiefs ordered her to go with Raif, a Proctor from the world Outside. They said they had a Plan. Well, the Seven Chiefs always had a Plan, and Shayla had plans of her own after suffering 13 years as a member of the humans’ World Council. Raif had never intended for things to go this far. A few months, maybe a year, and he could send the little Phoenician girl home again, back where she belonged. She’s not a little girl anymore and now he finds himself in competition with his own progenitor for control over his Heir–and future. It’s not a Councillor’s job to protect a Proctor but that’s just what Raif needs right now. Can Shayla save him before he loses his mind completely? Awesome, just Awesome. I stayed up way too late on multiple night to read it and still would have been happy for more. (I wonder if I could claim recompense from Baldwin for the bags under my eyes.) I just loved the characters’ personalities and their interactions. They all had their own little bit of wit that was distinctly different from one another. I did wonder how it was that the bad guys continued to get away with their depravities, since everyone seemed to know about them. But it didn’t bother me enough to get huffy about. What I loved the most about the story is that Baldwin was willing to let people be unhappy. Don’t get me wrong I love a happy ending, but it always feels disingenuous when plots spin like pinwheels to bring one about for everyone involved. Let’s face it. Life is hard. People don’t always get what they want. They die or are left dissatisfied for a million other reasons. I really appreciate that Baldwin was willing to allow her characters this slice of reality in their fictional world. I’m not saying no-one leaves the last page ofConditioned Response happy, just that I liked the balance. Baldwin is, quite frankly, the kind of writer that leaves other feeling inadequate. She is definitely playing with the big boys. I would happily compare her to Asimov, Huxley or Heinlein. Not only was it clear and easy to understand, it never felt forced and always managed to find the right tone for the scene. I am in awe…and I’m not really one to fawn over people. I just can’t wait to read the rest. This entry was posted in books/book review and tagged book review on October 30, 2012 by Sadie. 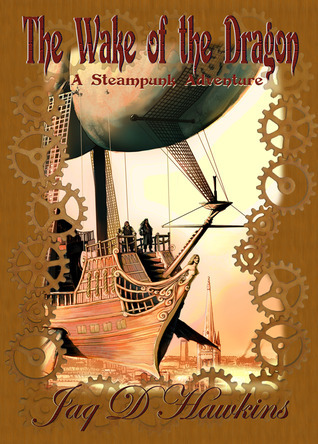 Author, Jaq D. Hawkins, sent me an e-copy of the steampunk adventure, The Wake of the Dragon. No sane airshipman will fly near a storm, but the cover of storm edge offers effective concealment for airship pirates who can strike quickly from above before anyone knows a ship is near. With the protection of Aide, the goddess of air travel, one airship defies the elements to seek fortune for the rag tag aerialists who make up the pirate crew. The elements are the least of their problems when they find themselves saddled with an airsick clerk, a crewmember suspected of working for the East India Company and a love sick farm girl whose headstrong misconceptions compel her to seek adventure where no decent woman would wander unescorted. Battling businessmen, mechanoids and villagers armed with torches and pitchforks, Captain Bonny must decide who to trust, and if the only rational course of action is one of apparent madness. The Wake of the Dragon follows the events directly following a large air-pirate heist. While this provides an interesting back-drop for an adventure story, it feels as if it could be just any old day at the office for the people involved. There is no feeling that this is “the big one’ or ‘the final one’ or extra important in any way and therefore worthy of note. I was a little disappointed about that. But the writing is very good (if repetitive at times), the steampunk technology interesting, and the characters relatable. I especially liked the pirates dedication to their goddess. There is also some appreciable humour and wit, especially in poor Dudley’s discomfort and the captain’s relations with his first officer. While The Wake of the Dragon might not be all heart stopping action, it is very good and well worth a read. If you like steampunk in the slightest I would recommend picking it up. I’m definitely up for reading more of Hawkins’ writing. This entry was posted in books/book review and tagged book review on October 27, 2012 by Sadie. Author, J.D. 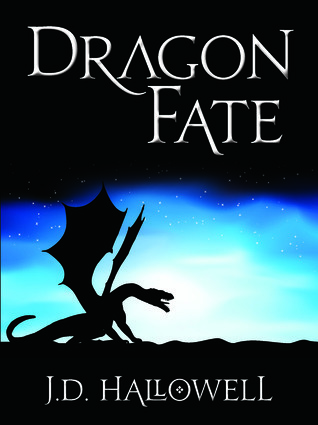 Hallowell, sent me an e-copy of his fantasy novel Dragon Fate. Delno Okonan is a young former soldier eager to put the swords and strife of war behind him, when a chance encounter leaves him inextricably entwined in a tangled web of dragons, magic, and intrigue, as he struggles to find his place among dragons and men, and stave off a plot by renegade dragon riders that threatens all he now holds dear. Teens and adults alike will find themselves hanging on every twist and turn. I wonder if it is possible to have slice-of-life fantasy (or fantasy slice-of-life). Either way, that is essentially what this book is. A man stumbles upon a dragon and then goes on his merry way, eating, drinking, traveling, camping, occasionally talking to people, and learning about the care and upkeep of a dragon. It rolls along this peaceful path for a good 80% of the book (and I read it on a Kindle so it was actually 80%, as opposed to a generic long time expressed as 80%). The anatomy, social and biological requirements, etc of the dragons was incredibly well thought out and detailed. The reader, along with Delno, learns a lot about dragons, how to be a good person, and even a little basic physics (though it’s not termed that of course). I enjoyed that….or I did after I stopped waiting for it to turn into an action adventure along the lines of Eragon and accepted that Delno and Geneva’s relatively peaceful daily life was the story. There was a little adventure in the last 20% of the book, but I thought it almost felt tacked on. Delno had an answer to every challenge, everything went according to plan, and with one notable exception he only met trustworthy friends who were more than willing to defer to his authority. There was never any sense that he was even taxed by anything he encountered. He was a little too perfect in every way for that. Oddly, though, since I had by that time decided that his actions were important more as an example of a moral existence than as a series of events I wasn’t too bothered by his glittering perfection. The writing was very descriptive. If you enjoy your fantasy a little more on the philosophical side this is the book for you. If you’re looking for a heart stopping grand adventure this one might present a bit of a challenge. 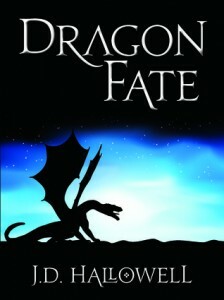 This entry was posted in books/book review and tagged book, book review, dragon on October 24, 2012 by Sadie.